I’ve been wanting to check out Natural Grocers (3901 Guadalupe) for a good while now. I see their insert in the Austin Chronicle and always marvel at the hot deals they offer, but their store isn’t anywhere near my neighborhood or on my usual paths. Recently, however, I enjoyed a satisfyingly saturating cooking class at the north Central Market (work perk/requirement)—Chef Clay Paschal’s “South Texas Sunday Dinner”—and found myself close enough finally to check out this relatively new store. Inconveniently, python-Mopac constricted me for 50 minutes on the trip north, so I only had about 10 minutes to tackle the store. I made out like a bandit, anyways, as their flyer specials, and even many of their everyday prices, hovered at rock bottom. The only cashier stationed at the time of my visit was very friendly, and I found myself in line behind just one other customer, so the transaction went quickly. Besides Natural Grocers’ sales, I noticed that their regular prices on many Organic Valley products were lower than all the other stores I frequent. I discovered a new (to me) brand of organic dairy products out of Iowa, Farmers’ Creamery, which produces a non-homogenized, low-heat pasteurized whipping cream! At Natural Grocers, the quart bottle costs only $5.79. I think I’ll drink a glass! Natural Grocers current sales flyer includes such great deals as organic bananas for 69¢ a pound (all the bananas were green-green when I shopped), Organic Valley butter $3.99 a pound (for bakers, a sweet enough price to perhaps warrant the drive north), Tom’s of Maine toothpaste 5.2 oz. and 6 oz. $3.95 (I only found non-fluoridated varieties on the shelf), Maranatha no-stir peanut butter, creamy (organic) or crunchy (natural), 16 oz. jar $2.49, Crown Prince skinless & boneless canned sardines 3.75 oz. $1.89 (check out the current issue of Eating Well magazine for their endorsement of sardines, plus recipes), and Organic Prairie frozen ground turkey, 12 oz. for $3.99. a pie of a deal! Natural Grocers is offering these deal through May 15 (Hey! I think somebody I know has a birthday that day). I hope to find another tasty excuse to venture north before then, so I can take advantage of serious savings on products that I enjoy. 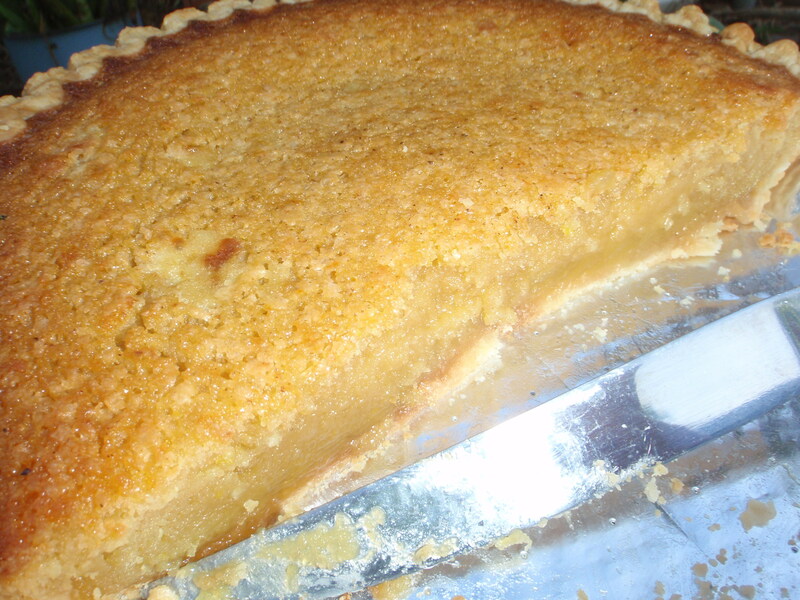 Maybe Chef Clay will bake more yummy buttermilk pies, the inspiration for this Tyler Pudding Pie-inflected yogurt pie. 1 unbaked 9″ pie crust, homemade or organic. Right now Wholly Wholesome frozen organic pie shells (regular or whole wheat) are on sale at Newflower Market $2.99 for a 2-pack. 1 stick organic butter, melted and slightly cooled. I love Organic Valley. Click for a coupon. Remember Natural Grocers sale at only $3.99 for a pound! ½ cup homemade or organic full-fat yogurt, room temperature. I make mine with either Swede Farm Dairy or Wateroak Farm goat milk. Click for instructions on making your own. 100 grams (½ cup) turbinado sugar. I buy this in bulk. Remember to bring your own container and have the staff tare the weight for you. scant ½ teaspoon salt. I like Real Salt. 50 grams (¼ cup) organic all-purpose flour. Costco has recently started selling an organic all-purpose flour from Utah for about $11 for two 10# bags. Other than the warehouse bargain, Whole Foods 365 brand usually offers the best deal on a 5# bag. ½ Tablespoon (1½ teaspoons) organic cornmeal. I use Arrowhead Mills. 250 grams (1¼ cups) organic sugar. Costco does it again with their bargain-priced Wholesome Sweeteners 10# bag for $7.77. If you don’t do the warehouse and you didn’t stock up on Central Market’s sweet organic sugar sale last month, check out your local bulk department for reasonable deals. Preheat oven to 425°. If you have a baking stone, place it on the lowest rack and heat it up also. Prick the bottom and sides of the crust with a fork and place it on the preheated stone. Bake for 6 minutes. Check the crust and gently press down any puffy areas with a wooden spoon. Bake for another 4 minutes, until browning in spots. Place crust on a cooling rack and turn oven down to 350°. While crust is baking, stir turbinado and salt into the yogurt and let sit to dissolve. Gently stir eggs together with a fork. Don’t whip air into them, just break up the yolks and whites. Stir the eggs into the yogurt. Use a wooden spoon or flexible spatula, not a whisk. Try not to incorporate air into the mixture. Stir in the butter. Whisk together the flour, cornmeal and sugar. Gently stir the dry ingredients into the yogurt mixture. 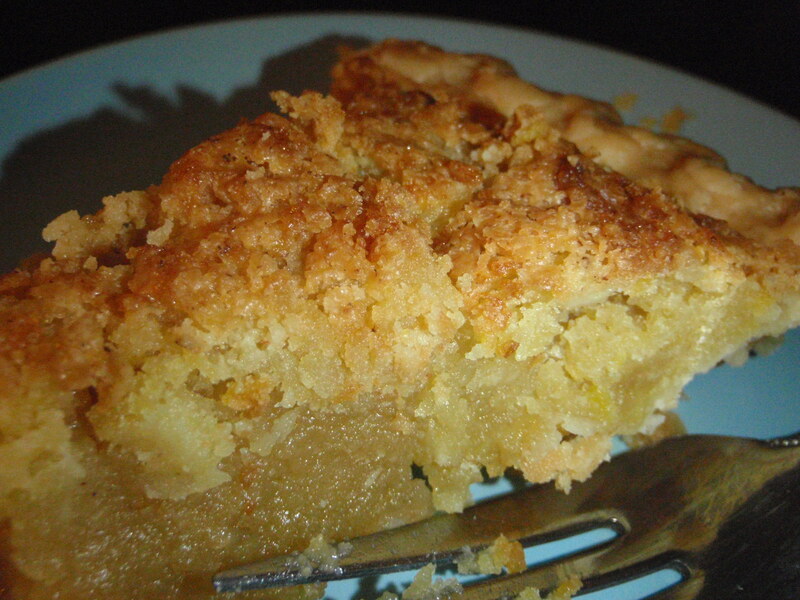 Place the pie crust on a baking sheet and pour the filling into the crust. Grate nutmeg over the top and place the pie, still on the baking sheet, onto the baking stone (or just on the rack if you have no stone). Bake for about 40 minutes, until set and lightly browned. This pie is delicious warm. Enjoy!